(Phys.org) —Back in the early sixties, physicist Richard Feynman gave a series of lectures on physics to first year students at Caltech—those lectures were subsequently put into print and made into text books, authored by Feynman, Robert Leighton and Matthew Sands—and now they've been formatted for the web and put online with free access for anyone who chooses to experience them. Titled, The Feynman Lectures on Physics, they have been divided into three volumes: "mainly mechanics, radiation and heat," "mainly electromagnetism and matter" and "quantum mechanics." Feynman was known in the physics community for his work in several areas, particularly quantum electrodynamics, particle physics and superfluidy—he also came up with a way to pictorially diagram mathematical equations, which became known as Feynman diagrams. He also was part of the team that worked on the atomic bomb project and shared a Nobel Prize with Sin-Itiro Tomonaga and Julian Schwinger in 1965. To the rest of the world, however, Feynman was a bona fide scientist celebrity, sought out for his opinions and observations as new science discoveries or problems appeared. In later years he was a member of the panel that looked into the cause of the first space shuttle disaster. He achieved his fame through serious science, good looks and personality—some journalists began calling him a rock-star physicist for his ability to capture the attention of listeners and to hold on to them as he made complex topics seem understandable by the masses. 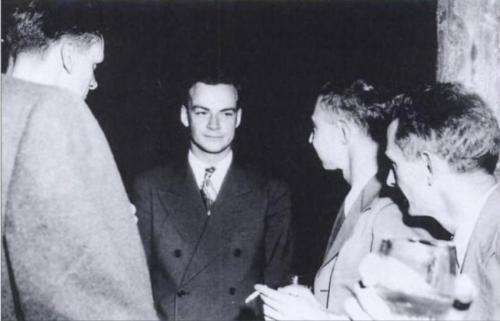 From 1961 to 1963, Feynman gave a series of lectures at Caltech, from the point of view, as he described it "that you, the reader, are going to be a physicist. This is not necessarily the case of course, but that is what every professor in every subject assumes!" His lectures became so popular that higher level students began signing up and established scientists occasionally dropped in to listen as well. He soon became known as "The Great Explainer" cementing his name in popular lore. In 1964, Feynman along with Leighton and Sands published a textbook based on Feynman's lectures—over time it became what has been described as the most popular physics textbook ever published. And now, it is being made available online for free for computer and smart device users—it's even been specially formatted to allow all users to view both math formulas and diagrams. These lectures are definitely worth it. Been listening to them on and off for years instead of music whenever I'm on long car trips. And every time I discover something new. Antialias, where can one find the recorded lectures? I really don't remember whether someone burned me some CDs or I 'creatively' googled them myself. It was a long time ago. I guess you missed Feynmans most important lecture: The scientific method. Surely he is one of the Gods of modern physics. It is no surprise that so many people adorn him. ??? Microsoft had these lectures online years ago, free access.